This recipe is another low-carb essential for those following a healthy ketogenic diet. I&apos;ve already shared a few paleo crusts but this one is also egg-free and can be used for both sweet and savoury meals. It&apos;s a bit more difficult to work with but it&apos;s definitely worth the effort. It&apos;s tastier and more flaky (but also more fragile) compared to my other recipes. I used psyllium powder, glucomannan powder and water to substitute the binding effect of eggs. Another egg-free option is be to use some flax meal - it has proven to be an essential ingredient in my keto grain-free tortillas. Thats why I included another egg-free version in this recipe. Macronutrient ratio: Calories from carbs (5%), protein (10%), fat (85%). For best results, use a kitchen scale for measuring all the dry ingredients. Using just cups may not be enough to achieve best results, especially in baked goods. Weights per cups and tablespoons may vary depending on the product/ brand. 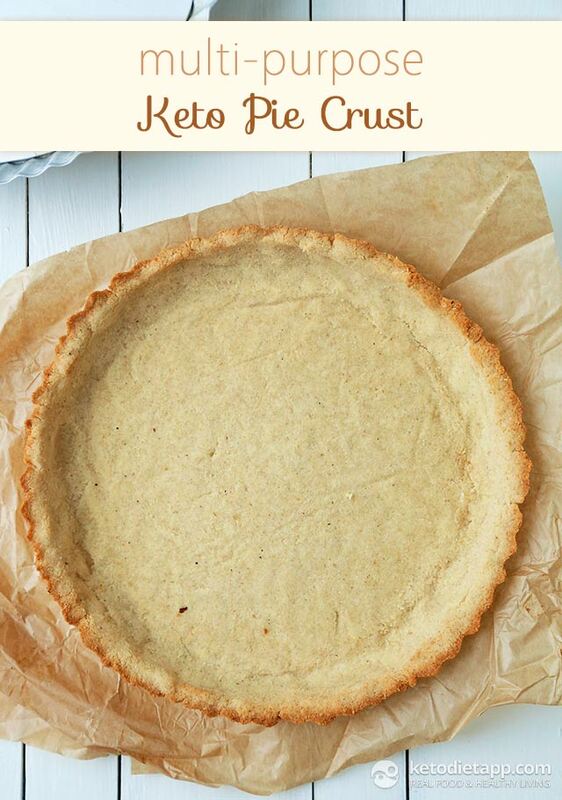 This recipe makes 8 servings - 8 small pie crusts or one regular pie crust. Mix all the dry ingredients - the almond flour, coconut flour, psyllium powder, glucomannan powder and salt (Recipe 1). Add the butter cut in pieces. 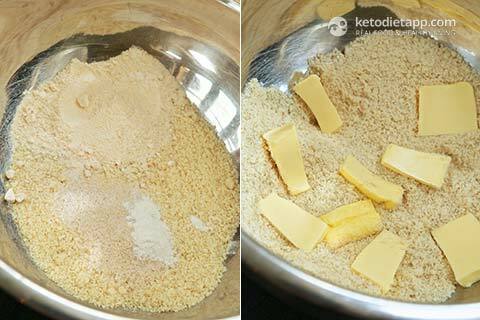 Using your hands, combine the dry ingredients with the butter. Add water and mix until well combined. 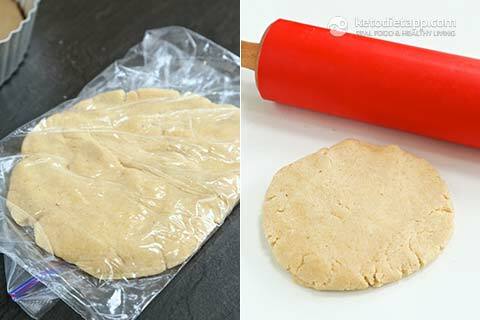 Place the dough in a plastic wrap and flatten using your hands. Place in the fridge for 30-60 minutes. Preheat the oven to 175 °C/ 350 °F. Method 1: rolling. Remove the dough from the fridge and roll out (I used a nonstick silicone rolling pin) till the dough is about the size of a pie pan - I used a non-stick pan with a removable bottom. Because there are no eggs in this recipe, the dough will be very fragile so you&apos;ll have to be careful not to tear it apart. Method 2: press down. 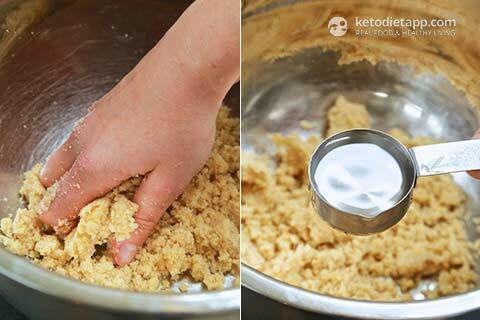 Alternatively, place the dough directly into a non-stick pan with a removable bottom and press up the sides using your fingers to create a "bowl" shape. Use a dough roller or wet your hands if needed. 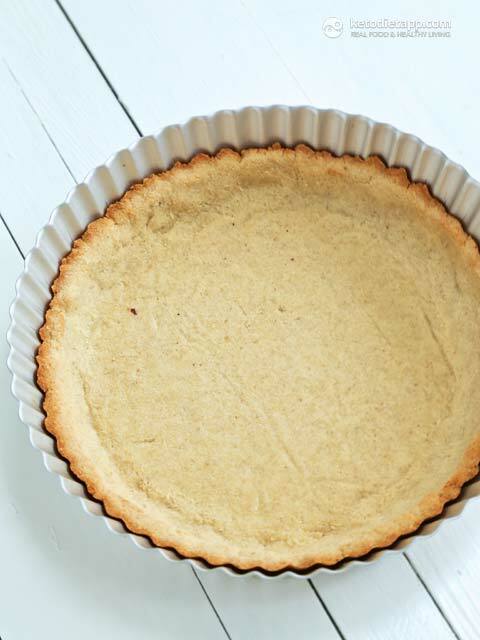 Ideally, use a baking sheet as lining for the bottom to ensure that the crust doesn&apos;t get stuck to it. 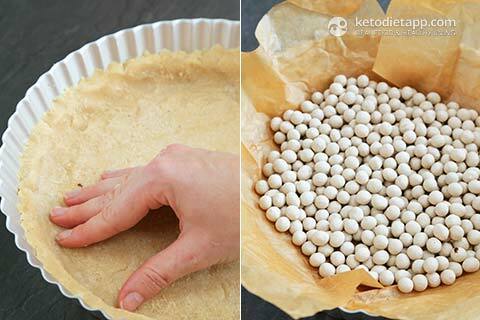 Place baking paper on top and use ceramic baking beans to weight the dough down. You will need them to prevent the dough from rising and creating air bubbles, especially if you are making a large pie. Place in the oven and bake for 18-20 minutes. When done, remove from the oven. Remove the baking paper with the ceramic beans. If the center of the pie seems too moist, place back in the preheated oven (switched off) just to dry out. 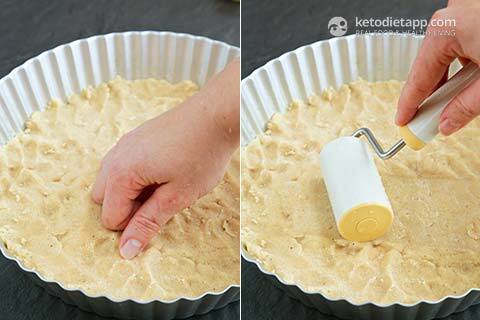 Fill with your favourite filling (keto lemon curd, whipped cream, or any savoury filling like pork and eggs or chicken). If not using straight away, let the pie crust cool down. Once chilled, store in an airtight container and keep at room temperature. I see that you use glucomannan powder or xanthan gum in all of your crusts but what if you don't have these items? are they necessary? Do you think it would be possible to freeze the uncooked dough? I've only tried freezing the cooked dough but I think it should work with uncooked too. I used a 21 cm / 8 inch pan - or you can use more small pans. I love your app and recipes! I really appreciate that, Lisa! It would really help if you could leave a review on the AppStore  Thank you! Hi Sarah, yes, check out the other recipes (below ingredients). Hope this helps! It's so difficult to find egg-free keto recipes and I have an egg allergy. Thank you so much for this recipe, will be making the apple pie from your blog this weekend! Hello! I love your blog and app! Thank you for your hard work. I am no longer able to see the recipes at the top of your page - there is a large blue bar now that says HOME or BLOG and it covers the recipe finder. I am not sure if anything recently changed on your site - but - this is new to me! ; ) I am not sure if it is JUST ME or if anyone else has this same new problem. Thank you again for the inspiration and delicious recipes. PS - Can't wait for your book to ship on Amazon. Thank you Teresa! Which browser are you using? We did change the website but there shouldn't be any issue with viewing content. Try to reload it a few times - you should be able to see the recipes right below, just scroll all the way up on the blog page. Hope this helps!